An Olympic victory was not just my dream, it was my destiny and God’s plan for His glory. 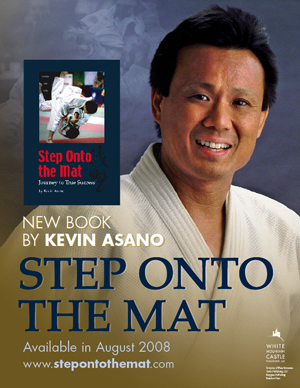 I devoted eighteen years of my life in judo to reach the epitome of sports success. My energy and focus went into an ultimate goal of winning the gold medal at the Olympic Games. To this day, much of my thinking and paradigms are influenced by those experiences, relationships, and knowledge. And as I reflect on all I’ve accomplished, I want to share a final story that brings success into perspective. After winning at the Olympics and then graduating from college, I moved back to Hawaii to start my new life. My silver medal represented all of my life’s labor, dedication and sacrifice. I was so concerned about someone breaking into our house and stealing it that I hid it where no burglar could find it. This became a problem when, after a few months, even I couldn’t remember where I hid it. I tore up the whole house but still couldn’t find it. I was discouraged, thinking I had lost the medal for good. How important was that medal to me? The silver medal represented the greatest achievement of my entire life’s work; however, it is only a piece of metal. Over the years, it will tarnish and lose its shine. A thief could break in and steal it. When I’m long gone, it will be forgotten by the world. In fact, my name is only one line in the record books. My accomplishments have already become part of the past. What good are all of my accomplishments and successes, if at the end of my life, I lose what is really important? What if I achieve prestige in the world’s eyes and lack approval from God? What if I get rich and enjoy every comfort that money can buy…but in the end lose my soul? Sure, success and accomplishments are wonderful. But in the light of eternity I believe that only one thing matters: a personal relationship with Jesus Christ. Allow me to share with you how you can have a personal relationship with Christ. This has made all the difference in my life, and I would be remiss not to offer it to you. God created us with a purpose and destiny. Unless we find His plan for our lives, we are never truly fulfilled. We try to satisfy our emptiness with things like money, accomplishments, pleasure, drugs, or relationships. These seem to satisfy, but are very temporary, never really bringing lasting or true contentment. Because God is perfect and holy He cannot tolerate sin. Just as light and darkness cannot occupy the same room, a sinful person cannot stay in the presence of a holy God. The Bible goes on to say, “For the wages of sin is death” (Romans 6:23). This means all who have sinned – all of us – deserve death, or separation from God. If God stopped there, our lives would be meaningless and without hope. Yet one of the most well-known verses in the Bible is also one of His greatest promises: John 3:16, which says, “For God so loved the world that He gave His one and only Son, that whoever believes in Him shall not perish but have eternal life.” In other words, God loved us so much that He provided a way to forgive our sins and give us eternal life. God sent His Son, Jesus Christ, to die in our place. He lived a perfect life and, though He didn’t have to, Jesus took the punishment for our sins. His death on the cross paved the way for us to escape punishment. The exciting thing is that three days later, Jesus rose from the dead. This proved that He was not just a mortal man but indeed the Son of God. And by doing so He conquered sin and death to give us the free gift of eternal life. And finally, by committing our lives to follow Him. When we do this, God will come into our hearts and change us. “If you confess with your mouth, ‘Jesus is Lord,’ and believe in your heart that God raised Him from the dead, you will be saved” (Romans 10:9). There is nothing we can do to deserve God’s love and forgiveness. We receive His promises free by faith. Dear Jesus, I admit that I am a sinner and cannot save myself. I believe that You died on the cross for me. Please forgive me for all of my sins. I invite You to come into my heart as my Lord and Savior. With Your strength I will live my life for You. In Jesus’ name I pray, Amen. If you prayed this prayer, God has forgiven you and has given you a new life with a new purpose. You now have eternal life! When I received Jesus as my Savior, I didn’t feel any different or experience any strong emotions. But in my heart I knew something had changed. From that time on, I attended a Bible-believing church and started to grow in faith. Accepting Jesus into my heart has been the best decision that I have ever made. My prayer is that as you walk along your journey in life, you too will come to know Christ and have a personal relationship with Him. With Christ at the center of your life, He will give you hope and purpose that will change your life forever.